Metrolinx has created an online page for comments on a proposal to build a GO station in Innisfil (Metrolinx Engage). I added my cynical two cents and Rick Vanderlinde, of the Innisfil Journal, was kind enough to quote me in his newspaper article: “You would think they would build it where most of the ridership lives. That would be Alcona.” I went on to facetiously suggest that the Barrie South station could be moved to Alcona. I only wrote that because we were told a while back that Alcona was “too close” to Barrie to rate a station. And yet, Barrie can have 2 stations, Newmarket gets 3 and Innisfil gets zip. What’s the lesson here? The one that sprawls the most gets the most. That’s my point. I left off discussing Our Place, the official plan process, by quoting the Project for Pubic Spaces: “When you focus on place, you do everything differently”. That doesn’t mean that previous plans aren’t rolling right along. 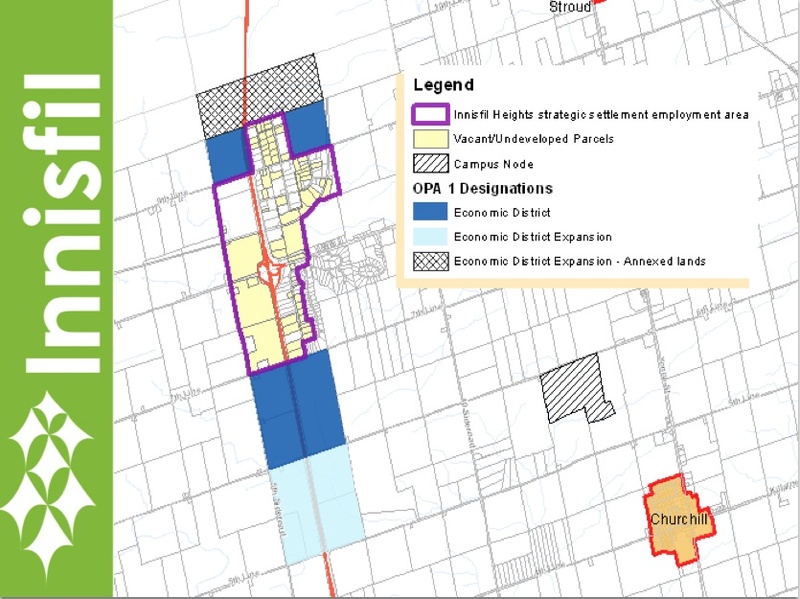 One of them is the long-standing plan to extend water and sewer utilities to Innisfil Heights, the area east and west of Highway 400, which is designated as ‘employment lands’. The rationale has always been that businesses attracted to this area will reduce the need for many residents to commute to jobs beyond Innisfil. The public is invited to an “informal drop-in” session to review the approved plan, “identified in 2004”, for massive “improvements” to Highway 400 between Highway 89 and Highway 11 north of Barrie. Simcoe County is proceeding with a plan to widen Innisfil Beach Road (County Rd 21) from 2 lanes to 4 lanes over a distance of 11 kilometres. It would extend from Highway 27 (County Rd. 27) at Thornton to the 20th Sideroad (County Rd 39) at Alcona. Bus Transit – Will Innisfil Get Onboard? Just six faces showed up at a recent public meeting called to inform residents about a bus transit proposal for Innisfil. If you missed it, like I did, you can click to view the Slide Presentation (2013 09 12 Public Transit Open House). And you can let the Town know what you want by completing the Transit Survey (available online to October 11, or print a paper version). The Town of Innisfil is asking for ideas and comments from Innisfil residents concerning a Transportation Master Plan. A short survey of about a dozen questions is now available online to allow residents to express their preferences for types of transportation, potential destinations and routes. Click on Transportation Master Plan Survey to add your views and share your ideas. Work on the Plan is scheduled to begin now with an environmental assessment and will continue to the end of the year.